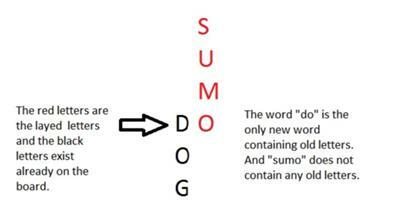 Hello, I was wondering if it is possible to lay a word on the board completely made up with tiles from yourself (SUMO) and not using any tiles from the board for that word, but creating a new word (DO) with one of the new tiles together with an already played word. If it works do both words count? Hi there Laurin - Thanks very much for going to so much effort to explain your question! Parallel plays like yours are crucial to garnering extra points in a Scrabble game, so you should always be on the lookout for these possibilities. Also, make sure you learn all the valid two letter Scrabble words, as this will really increase the number of parallel plays available to you. Thanks for your question - I hope I've answered it.